WASHINGTON, DC – President Trump, Vice President Pence, Speaker Ryan, and Majority Leader McConnell gathered in the Rotunda of the U.S. Capitol on Wednesday where Rev. Billy Graham lay in honor, one of only four private citizens in American history ever to receive such a tribute. Congress extended this extraordinary honor in tribute to America’s Pastor, who preached the gospel for more than 70 years to millions of people around the world. Streets around the Capitol were barricaded throughout the day, as police barriers were used to create metal aisles where well-wishers could wait to enter the hall under the Capitol’s massive iron dome. Attendees waited in line for up to three hours to gather around the simple wood casket adorned with a wooden cross, the quintessential symbol of the gospel Graham preached. That is a reference to the Evangelical Christian belief that Jesus Christ was God in the flesh, that he lived a perfect life, died on the cross in the place of sinners to pay the penalty for sin, was bodily resurrected from the grave three days later, ascended into heaven, and will one day return in glory. Evangelical Christians believe that anyone who repents of their sin and places their faith in Jesus is forgiven by God and brought into an eternal relationship with him. That was the gospel that Graham preached for almost eight decades. An honor guard of Capitol Police flanked the casket, with formal periodic changing-of-the-guard ceremonies throughout the day. Members of the Graham family took turns at the head of a receiving line, earnestly thanking each of their fellow Americans for taking time to pay their respects to their father or grandfather. Three wreathes were hung around the casket. Both legislative chambers housed in the Capitol – the House and the Senate – each offered one, and the executive branch offered a third. Only 33 Americans have ever been privileged to lie in honor in the Capitol, 11 of whom were U.S. presidents. 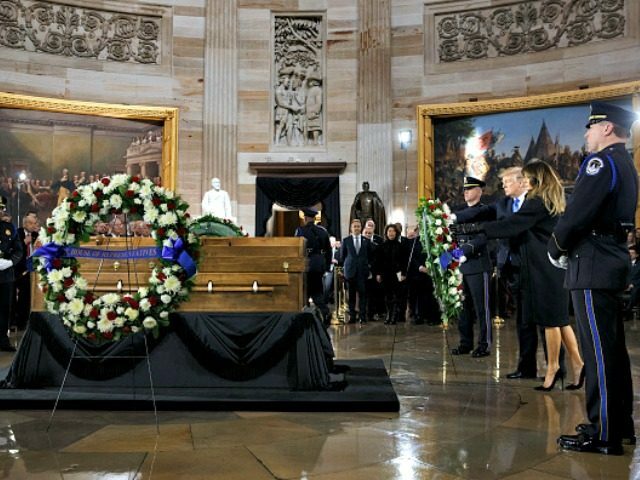 Of the three private citizens to lie in honor before Graham, two where policemen who sacrificed their lives protecting innocent people inside the Capitol, and the third was civil-rights hero Rosa Parks. Billy Graham will be buried in North Carolina on Friday. The President has ordered flags in America flown at half-staff in honor of America’s Pastor.